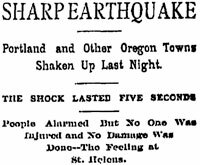 The [Postal Telegraph Company] operator at St. Helens, on the Columbia River, in Columbia county, answered that he felt a very heavy shock at 8:37 and immediately after a long report came from the direction of Mount St. Helens, an extinct volcano. The operator looked in the direction of the mountain, but it was obscured by clouds, and he noticed nothing unusual. According to the U.S. Geological Survey organization, the buildings swayed, and terrified people rushed into the street. Astoria and Salem also felt the quake, and in Umatilla several building were damaged.